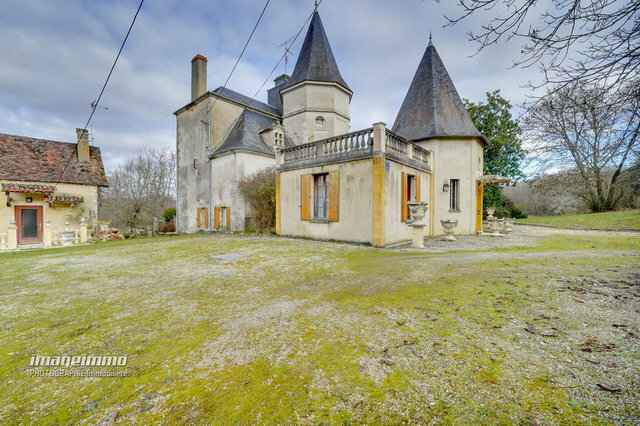 XVI century castle with a cottage, guesthouse, outbuildings, terrace overlooking the countryside, 12x5 swimming-pool and underground cellar. The castle comprises 6 bedrooms, 2 living-rooms, 2 dining-rooms, a kitchen and an outdoor kitchen. The guesthouse comprises a kitchen, a living-room, a bedroom, a bathroom and an attic. This property is set on over 79 acres of meadows and woods with a small stream and a spring. (part of the land is rented out).